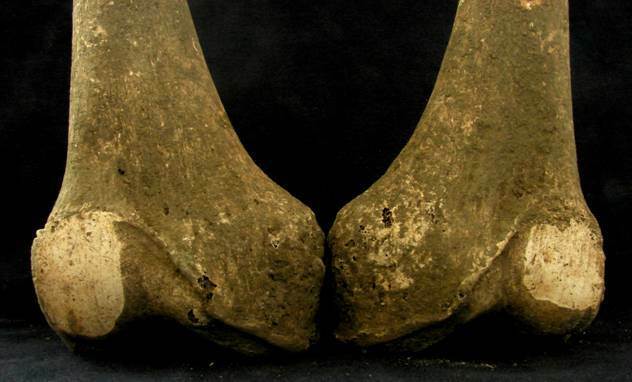 Let's catch up on the last couple weeks of Roman bioarchaeology news, shall we? September 12 - via Sofia Echo and Novinite. Bulgarian archaeologists announced the discovery of a Roman-period (1st-2nd c AD) tomb in Thrace (modern-day Borissovo). The tomb had been looted at some point in the past, but numerous artifacts were still recovered, including a portable table, a unique drinking vessel, a cup to collect the tears of the mourners, and a burial chariot. The chariot, partly destroyed by tomb robbers, is decorated with eagles whose wings terminate in dragon heads. There were also remains of an altar strewn with various animal bones and broken pottery. There is no mention of any human remains, but if cremation was the norm in this place (and likely was the norm for high-status people in the early Imperial period), they might be found within a vessel or might not be recovered at all. Unfortunately, no pictures seem to be published yet of this remarkable find apart from one of the eagle heads from the chariot. September 2011 - via Fasti Online. Jeff Becker has written up a summary of the 2011 field season at Gabii, an urban center a couple dozen kilometers from Rome in the suburbs. I've previously blogged about the skeletons of the Gabines based on my analysis of the graves found from 2009-2010. At this point, we have over 30 inhumations from the Imperial period (1st c AD onward), including three individuals who were buried in lead or lead-lined sarcophagi. The first one was discovered in 2009, and the second two during the 2011 field season. Of course, Romans tended to bury their dead outside the city walls, so the fact that there are burials within Gabii (and not in the extramural cemetery that was discovered in the late 90s) likely means the city was contracting by the Imperial period. Fasti Online has links to the last several seasons of excavation at Gabii as well. Hopefully, I'll have a bit more to report on the Gabine skeletons in a few months, as I have an abstract in submission to next year's AAPA meetings. In the meantime, here's a picture of one of the Imperial Gabines, a man in his early 40s, who had really severe osteoarthritis of both knees in addition to a host of other pathologies. July 30 - via Corriere del Mezzogiorno. Although this find may not be Roman-period, I wanted to highlight it anyway because I haven't found any additional reporting. A man touring the ancient site of Paestum supposedly fell into a hole and discovered previously unknown Etruscan(?) tombs. Previously unknown to researchers, that is, but apparently known to the tombaroli who had plundered the tomb in the past. Archaeologists are now working at the site and have found numerous frescoes. There are a bunch of photographs on the Corriere del Mezzogiorno site, but all appear to have been taken with a shaky cell phone. Still, the frescoes look good - lots of red paint still left, interesting designs, depictions of musicians, and dragons or other mythological creatures. A very cool find. Who knew one could discover ancient tombs just by falling into a hole? September 17 - via Le Figaro. The Maillol Museum in Paris is holding an exhibit with a reconstruction of a Roman house and stories from the destruction of Pompeii in 79 AD. Although it doesn't seem to boast any human remains or body casts, the title of the exhibit is Vivre et Mourir a Pompei - Living and Dying at Pompeii. Could be worth a visit! September 12 - via Archaeology News Network. The skeletons dubbed the Lovers of Valdaro are in need of a new home, and the Lovers of Mantua are campaigning to raise money - over 200,000 euros - to get them one. While the Lovers are not Roman-era (they are in fact Neolithic in date), they attracted a lot of attention when they were discovered because these two teenagers - a male and a female - appear to have died or been buried in an embrace. 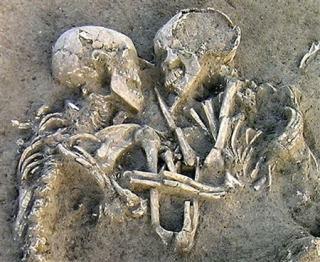 Their discovery so close to Mantua lent a Romeo and Juliet quality to the Neolithic skeletons. September 15 - via PoweredByOsteons. I discuss the isotopic evidence for foreign women in Imperial Rome. This post is the complete presentation written by me and given by my coauthor Rob Tykot at last week's European Association of Archaeologists meeting. In short, there were plenty of foreign women at Rome, but we don't know a lot about the structure of immigration to Rome or the reason these women may have moved - slavery, marriage, work, family, etc. Of course, you should expect to read more about foreigners at Rome as I continue to publish my dissertation research. To the right is a photograph of the jaws of an older woman who may have arrived at Rome from as close as the Apennines but whose dental health was significantly worse than the average Roman's. September 20 - via BonesDontLie. 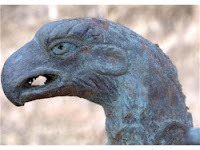 Katy Meyers is currently jaunting about in Italy, and she posted a dispatch from her visit to Pompeii. September 17 - via Suite101. Sharon Brookshaw wrote a summary of Roman dental practices for the site Suite101.com. I'll admit that I don't know that much about this site - it seems to include short reports like About.com does, but its name to me suggests a place where undergrads go to get help on their papers. Or maybe it's a blog. At any rate, Sharon talks about how the Romans cleaned their teeth and mentions the 2007 discovery of a Roman woman who had a dental bridge that was held in place with gold wire. 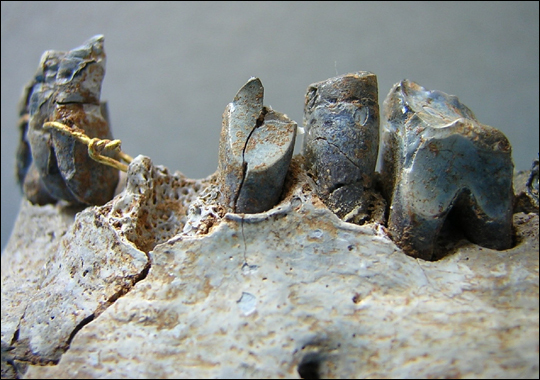 Additional pictures of Roman dental work can be found at Discovery News, but here's the picture of the gold wire find. Check back in two weeks for more Roman bioarchaeology news!